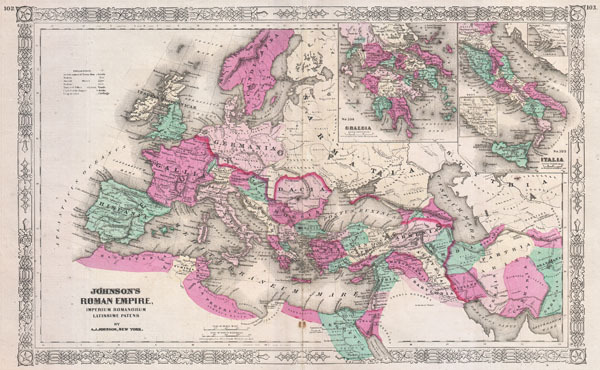 This is A. J. Johnson's c. 1864 map of the Roman Empire. Depicts the whole of Europe as well as parts of North Africa, Asia and Persia. Inset maps in the upper right quadrant detail Greece and the Italian Peninsula. Features the Grecian style border common to Johnson's atlas work from 1864 to 1869. Prepared by A. J. Johnson for publication as plates no. 102 and 103 in the 1864 edition of his New Illustrated Atlas…. Johnson's New Illustrated (Steel Plate) Family Atlas, (1864 or 1865 edition).